This limited, small-batch release is dark garnet red in color with a candied-fruit like aroma and flavor. 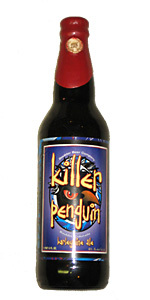 At 10% ABV, Killer Penguin is a big barleywine that comes across very smooth and extremely balanced -- the perfect beer to share among friends. From the 22 oz bottle in a snifter via a friend from work---cheers Randy! borderlines on medium high, medium body, and a sweet booze and hop accentuated finish. for a change of pace. A rum barrel aged version of this would go over swimmingly. Look. Dark amber almost red looking. Smell. Pretty 1 dimensional. Nothing stands out. Taste. Follows nose. Not a ton of depth or bite that typical BWs have. Feel. Decently smooth with high carbonation at the end. Overall. So so. Would not buy again. Not terrible. Just better options. L: Dark Amber red with notes of orange where the light hits the glass, very little head or lacing on the glass. S: Notes of caramel, toffee, cherries, not much hop presence, very muted for a barleywine. T: Strong notes of caramel and toffee, notes of cherry, a medium bitterness. A bit one deminsional for a barleywine. F: Heavy body higher carbonation. O: Not as much complexity as other barleywines. Pours a clear mahogany producing barely a finger of beige, rapidly diminishing head that settles to thin skim of foam leaving only hints of squiggly lacing. Aroma is sweet & fruity caramel malt, dark bread, brown sugar, raisin, fig, chocolate cherry cordial, spice, cereal grains, a hint of ethyl acetate & alcohol. Taste is similar but with woody oak/vanilla & cereal notes, whiskey hints with bitter roast & earthy hops in the finish & aftertaste. Mouthfeel is medium-heavy bodied with medium carbonation, slick, syrupy, quite prickly & somewhat grainy with a drawing aftertaste. The sometimes gets a bad review but I find it quite pleasing. L: Pours a nice reddish brown with a small khaki colored head that fades to a ring quickly. No lacing. S: Burnt sugar, toffee, molasses and fruit. And a hint of something I'll just call "bad perfume", which kind of ruins it. T: This comes across a little sweet, has a malty backbone and a hint of apple cider. F: Medium thickness, carbonation seems OK for the style. O: Alcohol is well hidden. There is something in the aroma and the aftertaste that just seems out of place. I don't think it's as bad as the Bros think, but certainly not one I'll pick up again.